There can’t have been a prouder person among the 1,539 crowd at The Shay when Halifax played Eastleigh in December than Steve Nichol. Town’s head of youth development was there to see defender Ross Barrows come off the bench to make his debut for the club in The Shaymen’s 2-0 defeat in the FA Cup second round. Despite the success of the youth team in reaching the second round of the FA Youth Cup and being on track to win their league, Nichol prioritises the progression of players to the senior side above anything else. On seeing Barrows’ debut, he said: “You are proud but you can’t put too much emphasis on one game, it is part of a longer term process. “Ross has shown plenty of signs he can progress. It was an incredibly hard game to make a debut, the pitch was more or less frozen and he was up against an experienced left-winger who tested him. 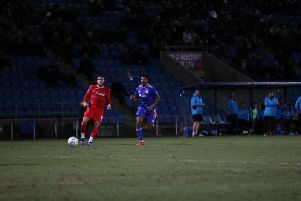 “Ross came to us as a right-back but we’ve challenged him this season by giving him games at centre-half so he’s getting more used to dealing with long balls, which is important in non-league. We’ve also given him games at centre-midfield so he’s getting more contact time on the ball and receiving pressure from different angles. He hadn’t played right-back for a while before making his debut so it was probably a little alien to him when he stepped on the pitch but he’s a strong character and the experience will have benefited him massively. “I’m convinced we have players at youth team level who can progress to the first-team. But it’s bridging that gap and getting used to the senior game. “Hopefully Ross will go out on loan shortly, like Shiraz Khan has at Frickley and Isaac Baldwin and Elliot Harrison at Ossett Albion, where they have all done really well. Town have agreed a sponsorship deal with Halifax-based insurance form RSA for their youth and community section, enabling them to buy new kit and pay for transport costs and the club’s minibus. There are two lead coaching staff involved with the youth team, as well as a tutor, a goalkeeping coach, a strength and conditioning coach and a physio. “That group have made history so our current squad have something to be proud of from their time at Halifax. The team remain in a strong position to win the National League Alliance this season, it could be a special year for the team and would reflect very well on our programme. “I also think this a sign of how far the programme has come and a credit to our staff for the hours of diligent work that goes on behind the scenes every day. “We were disappointed with the result against Sheffield United, although we were proud to have got to that stage. “We need more games like that to stretch our players, but unfortunately we don’t get that enough in our league. “I wanted to work on the basis that we have 50 per cent of games against teams at our level, 25 per cent against weaker teams and 25 per cent against stronger teams. “We will be reviewing our structures for next season to facilitate this better. “A lot of hard work went into that FA Youth Cup run; years of building the programme, recruitment, opposition scouting, match preparation and countless hours on the training pitch. “We have a very good team delivering the programme and those results on the pitch are a reflection of that. The area final of The National League Trust U11 Cup is taking place at North Bridge Leisure Centre on February 10. The National League Trust Under 11s Cup is open to all clubs who are members of the National League. The tournament, supported with funding from The National League Trust and FC Halifax Town, is open to primary schools, specifically boys and girls in the year 6 age group. Schools competing include Parkinson Lane, Elland, All Saints and Withenfields. The winning team will progress to represent Halifax in one of four regional play-offs from which the four winners will then go onto compete the final played at Wembley on Sunday, May 14.